Home • Blog • How Green People Helps To Make Your Visit To Denman Squeaky Clean! How Green People Helps To Make Your Visit To Denman Squeaky Clean! During your visit to Denman you might notice that all our bathroom products are provided by the skincare specialists, Green People. From the shampoo in your bathroom, to the soaps used in the cookery school, you’ll find a number of certified organic Green People products that can help you to care for your skin during your stay. Not tried Green People before? Read on to discover all you need to know about the brand and products they supply to Denman. Green People is a natural, organic, skincare and make-up brand. Founded in 1997, the brand has over 20 years’ experience of caring for sensitive skin and an award-winning portfolio of products from men, women and children. The brand in renowned for providing customers with a diverse choice of certified organic products, whilst minimising their impact on the environment. Approved by PETA, the Vegan Society and the Vegetarian society, Green People is also certified by the Soil Association, Ecocert and the Organic Food Federation. Proactive about protecting the environment, Green People helped bring about the 2018 ban on using microbeads in personal care products. They also work closely with environmental charities, such as PlantLife and the Marine Conservation Society, donating sales of their products towards helping these worthy causes. WHY DOES DENMAN USE GREEN PEOPLE PRODUCTS? Sensitive skincare experts since 1997 the Green People products you’ll find at Denman have been chosen as they are cruelty-free and do not contain harsh chemicals including SLS, Parabens or skin-drying alcohol. Suitable for all skin-types, including skin affected by eczema and psoriasis, the Quinoa products you’ll find in the bathroom are also gluten-free and suitable for Coeliacs. WHAT GREEN PEOPLE PRODUCTS WILL I FIND AT DENMAN? 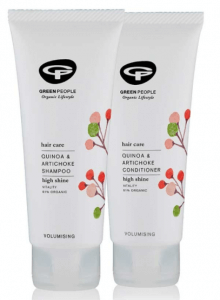 Suitable for all hair types, Green People’s Quinoa & Artichoke haircare range nourishes each strand of hair to restore vitality and shine. Containing 8 amino acids the shampoo and conditioner help to repair damage caused by exposure to UV radiation and smooth the hair’s surface for frizz-free locks. 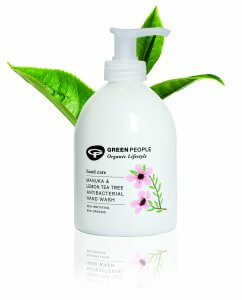 For optimum effects wash hair with Green People Quinoa & Artichoke Shampoo and rinse thoroughly. Apply Quinoa & Artichoke Conditioner to the lengths of your hair, focussing on the ends; you only need a small amount as a little goes a long way. Leave for at least 1 minute and rinse thoroughly. This supercharged, organic shower gel helps boost skin hydration and vitality. Suitable for sensitive skin it contains Quinoa which helps lock in moisture and Calendula which has soothing and natural healing properties. Free from SLS, it contains Sweet Orange and Ginger essential oils and Yucca which gently foams to remove impurities without irritating the skin. To use, wet the skin and rub gently onto the face and body. Wash and rinse with warm water, avoiding eye area. An antibacterial organic hand wash that is hygienic, ecological and kind to hands, Green People’s Manuka & Lemon Tea Tree antibacterial hand wash leaves hands feeling clean and moisturised. PH-balanced, this gentle, organic hand wash is free from SLS, Triclosan and irritating soap and is suitable for those who may be prone to eczema and psoriasis. For more information or to purchase the Green People products you can find at Denman be sure to visit https://www.greenpeople.co.uk or call their customer care team on 01403 740350. You can also purchase a selection of Green People products from the Denman shop on your next visit.